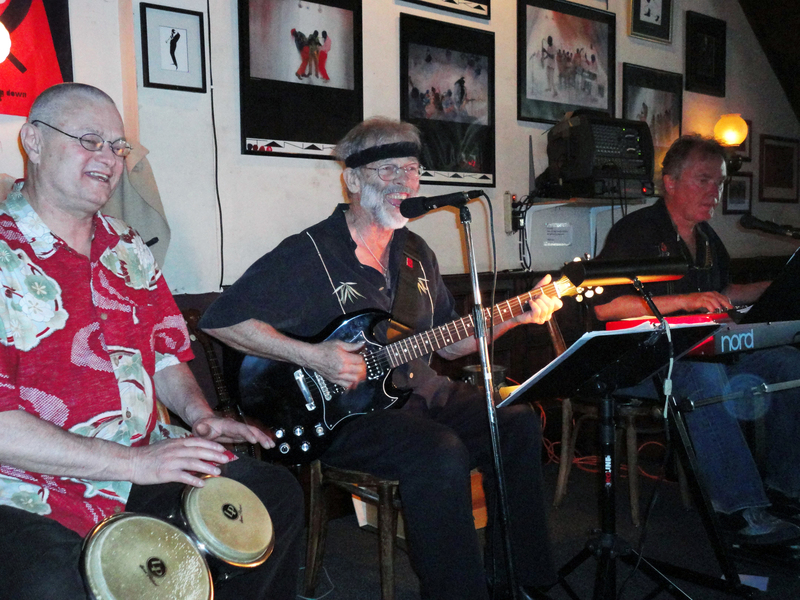 The Blue Monday Jam Session at the Sausalito Cruising Club on April 25 had over 22 participants, all of whom came to the stage and played. The house band, consisting of Joe Tate, Donny Kountz and Willie Riser, played the first set of lively blues, mostly covers of oldies but goodies. There was a surprise visit by two members of the Average Dyke Band and they performed several exciting dance tunes. This refers to Staphanie Teel and Carrie Gesendasy who appear here every other Monday and thus alternating with the Blue Monday Jam Session. Phil Berkowitz, Donny Kountz, Stephanie Teel and Carrie Gesendasy jam out! There were also many other excellent players taking the stage this night including John “Coyote” Egan with several of his students, who are all proficient guitarists. 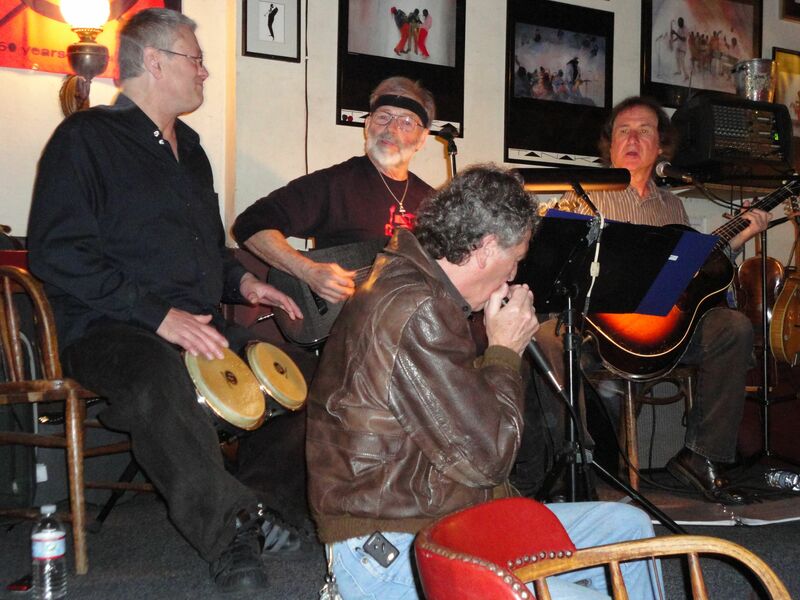 The Cruising Club also welcomed harmonica wiz, Phil Berkowitz who joined with Teel and Gesendasy as well as Gary Berger and Anthony Lincoln who wails on the sax and vocalizes some good old Motown songs. 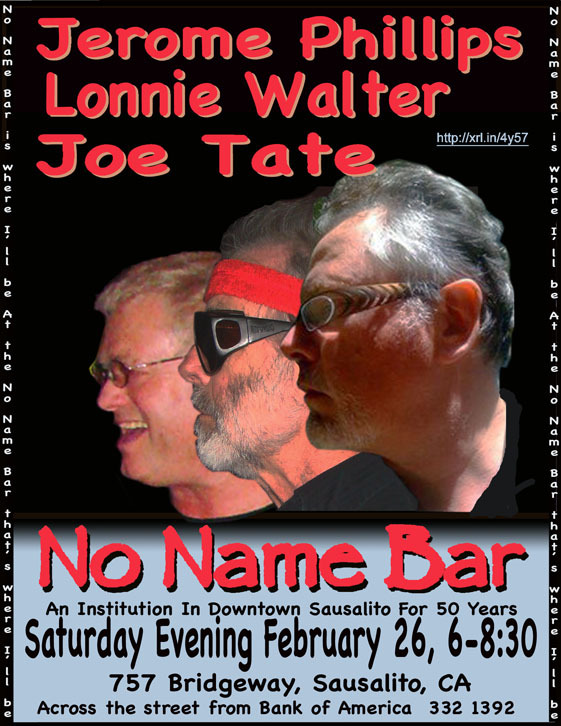 On Saturday April 30, Jerome Phillips and Lonnie Walter joined joe Tate at the No Name Bar. Joe Tate sang a couple things that brought the house down including Roosevelt Blues, which seems to clarify some things about American History. Jerome Phillips is an incredibly skilled musician who segues seamlessly between Gershwin, Leadbelly or The Beatles. This makes it easy for Tate to move around between the many genres he likes to dabble in. In other news, Saylor’s Restaurant and Bar ended it’s music program on April 31st. Eugene Huggins and Chris Goddard played the final show there. 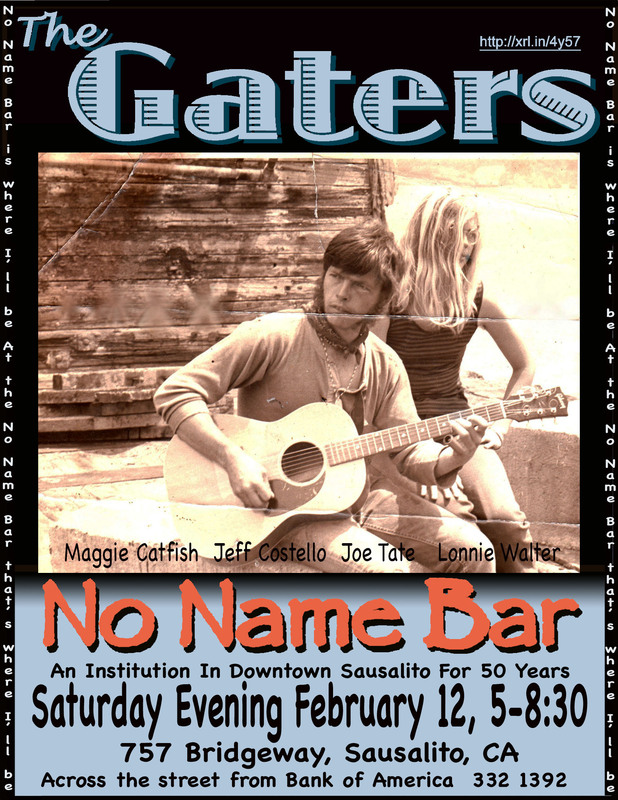 Their many years of playing at Saylor’s Landing every Sunday night had become an institution of the Sausalito social scene.. This came to and end when Sean Saylor moved his operation to it’s present location at the former Guernica Restaurant. The wonderful times had at both these locations will be long remembered by many. There is a happening scene at the Taste of Rome Restaurant at 1000 Bridgeway featuring music from 7-10 on friday and saturday nights. 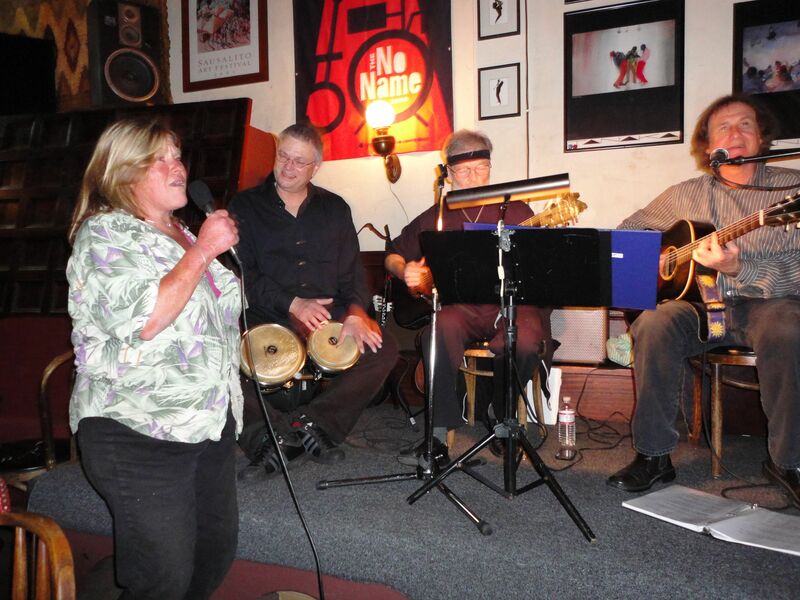 On May 6th, Joe Tate, Wendy DeWitt, Lonnie Walter and Kirk Harwood were holding forth as “The Taters.” The gig was supposed to be played with Joe and Cole Tate who call themselves The Taters but, Cole was away on important business. Wendy really stirred the audience with her virtuoso piano. While Joe is belting out some old favorite, Wendy has his back and drives it home with lots of torque, so to speak. Lonnie Walter plays bongos while Kirk Harwood has a pair of congos and other handheld percussion instruments. With the piano and guitar it all creates a very nice sound for a small place where a full band may get to be a little too much. The high point of the evening may have been when a troupe of Girl Scouts sat in one section all singing the responses to Minnie The Moocher. This of course is the Hi de hi de hi de ho song made famous by Cab Calloway which energizes audiences everywhere. Ceralde really showed what he was made of, burning up the fretboard with youthful riffs that were decidedly of the jazz and blues flavor. It’s refreshing to see a youngster with so much going on. 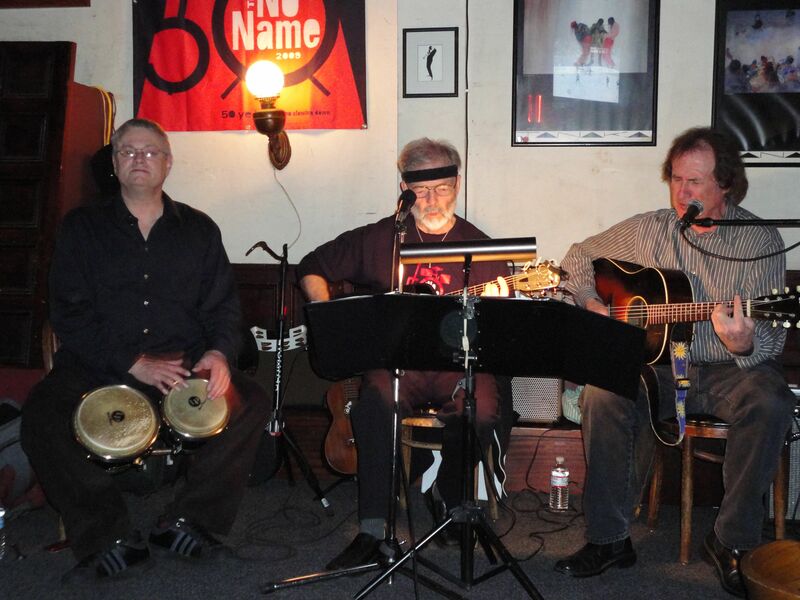 Miles Ceralde will be back at the No Name Bar with Joe Tate on June 25. 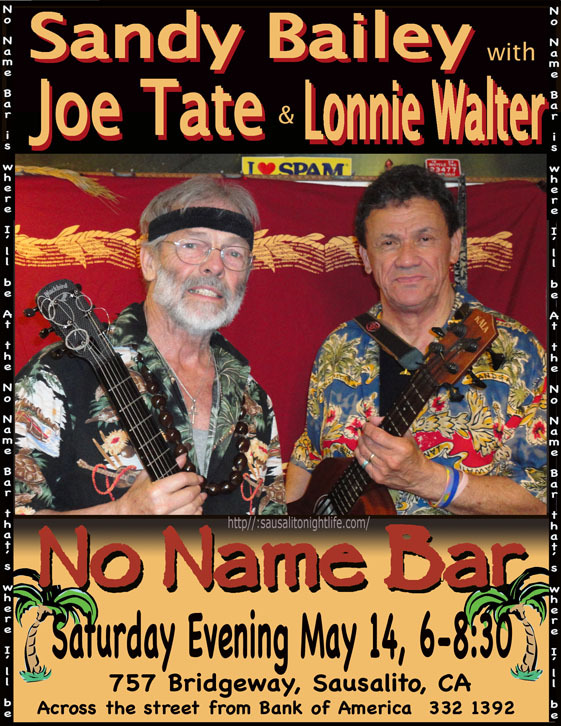 The next week Sandy “Ukulele” Bailey joined Joe Tate and Lonnie Walter at the No Name Bar for a show that was quite different than the usual. Bailey sings and plays ukulele and bass, switching instruments between songs as needed. 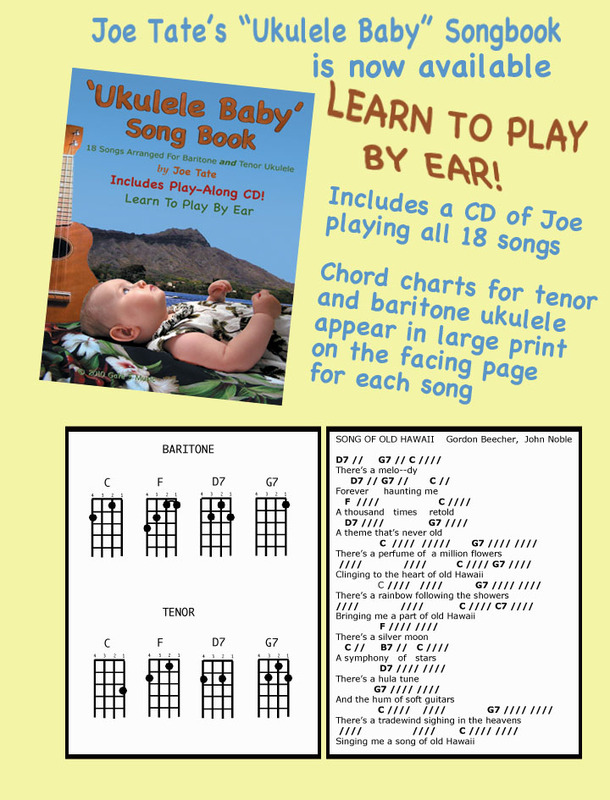 Joe Tate is an ukulele nut too and tonight he shares some of the bass duties when Bailey plays ukulele. 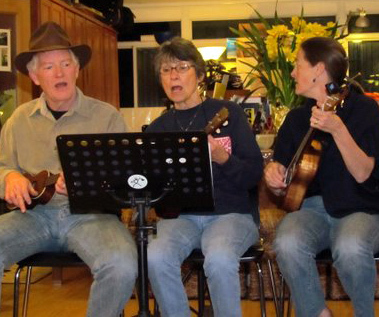 They performed many Hawaiian songs interspersed with Americana of the blues and jazz persuasion. 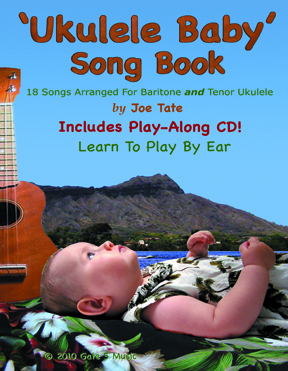 With Ukulele Bailey’s sweet smooth voice and Tate’s characteristic growl, the harmony achieved between them is remarkable, especially on the Hawaiian songs, some of which they deliver in the Hawaiian language. Bailey tore the place up with his rendition of On Bridgeway, a paraody of On Broadway, the smash hit by George Benson. The song even refers to the No Name Bar itself. When Ukulele Bailey returns June 18, you’ll want to come just to hear this song. A little later this same night, The Tickets played at the Sausalito Seahorse Restaurant which is located on Harbor Drive near Gate 5 Road. The Tickets sound great in this room which has pretty nice acoustics. 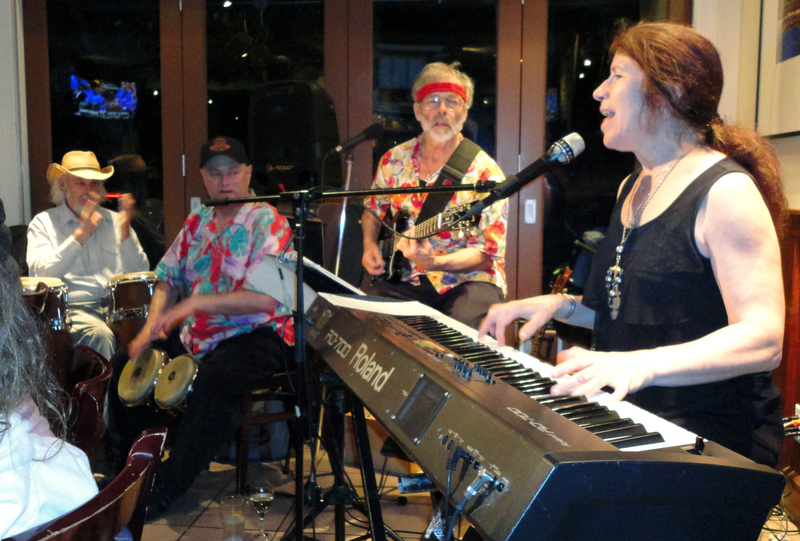 Debra Clawson, who fronts the group, has an unusual voice which lends itself well to the blues and pop music that make up The Tickets repertoire. This restaurant has good food and a nice atmosphere except for the lighting which is overdone. There’s all these weird computer driven LED spots along with colored lights on the stage which make the performers look like zombies. A lot of fun can be had here in spite of these small distractions. The UFOs meet every Friday at a secret location usually referred to as Area 51. It is, of course, a private party and privacy must be respected. 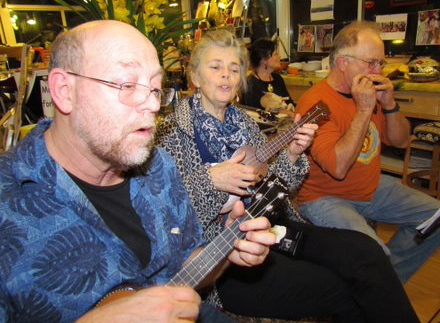 However, Night Beat has obtained permission to tell about the kanikapila, which is a music party involving ukulele playing and singing with emphasis on Hawaiian music. It’s also a pot luck dinner which is taken after about a dozen songs have been played. There’s usually about 20 singer players participating and it makes a wondrous sound with all the voices. 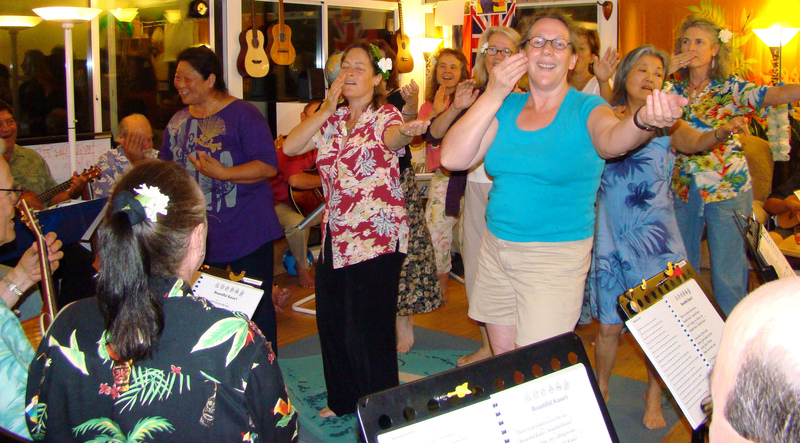 There are also several skilled hula dancers who jump right in whenever the right songs are played. Squadron Leader (SQL) Del Medina refers to each player as a pilot and the group frequently undertakes away missions for various other parties and club appearances. Tonight the first set features many of the traditional Hawaiian songs plus a few of what is called hapa haole songs. These are songs which may be of or about Hawaii, but don’t spring directly from Hawaiian tradition. Anyway, SQL Medina calls out the songs which the pilots find in their flight manuals which have the chords and words for about 200 songs. First off is Amelia Earhart’s Last Flight which recounts the last hours the fearless lady on her tragic flight. Then some Elvis tunes like Blue Hawaii and Can’t Help Falling In Love. Just to make sure, Blue Hawaiian Moonlight finishes the King’s set. 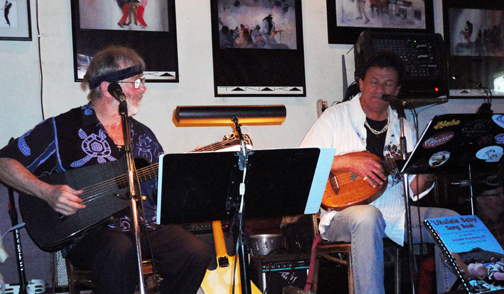 Several hulas are then played including Hanalei Moon and Koke’e written by Bob Nelson and Dennis Kamakahi respectively. There are also a bunch of Hawaiian songs with moving rhythms. In A Canoe and Manuela Boy come to mind. Theres also My Little Grass Shack, which never fails to generate excietment. After dinner volunteer pilots take the stage in groups of one to four and give their renditions of special songs they have prepared for the night. These usually follow a theme. The theme tonight was songs about mothers and this created some humorous offerings as well as poignant ballads and even a couple hymns. For instance Little Egypt was humorous and Farther Along was poignant. There were many more songs culminating in Ahi Wela/Lover Of Mine/Aloha ‘Oe, a beautiful mashup of Hawaiian treasures. Alohas were exchanged and everyone left. They would all meet again the next day at the Sleeping Lady Cafe where they play every Saturday at 2PM. 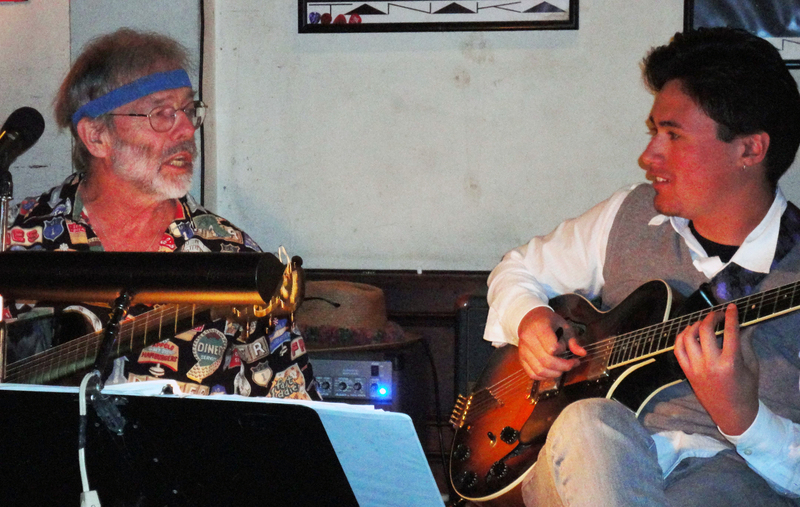 Joe Tate and Lonnie Walter play here every Saturday from 6-8:30, usually with a guest artist. This week it’s Wendy DeWitt, the queen of boogie woogie piano. 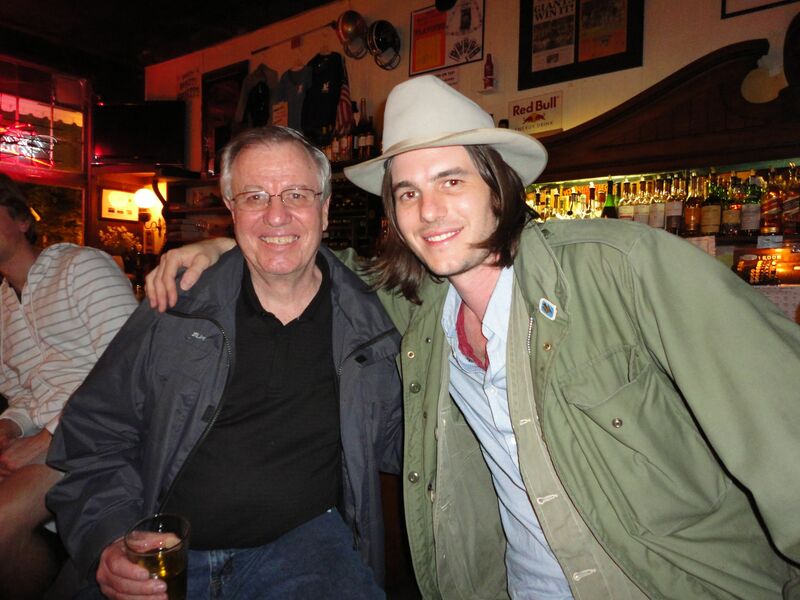 Also sitting in this week was harmonica man, Tom Barr. Joe started the evening with singing Slipping And Sliding, the Little Richard hit of the 50s. Then some New Orleans stuff like Rockin Pneumonia, the perennial favorite from Professor Longhair. Wendy and Joe take turns belting out some of the good old favorites that rock and boogie. These duties are shared two songs at a time, he plays two then she plays two. Wendy’s piano skills are amazing. Just when everyone’s jaw drops as she burns through some really hot passage, she engages the audience and gets their participation. Lonnie Walter carries the beat on the bongos and does some showy gestures with his hands .This always gets laughs and cheers. Lonnie has his own band called Lonnie’s Eggs. They appear regularly at the Saloon in North Beach. This worked well until some of the other local singers showed up. Tate can’t resist bringing them up to the Stage. First there was Lauralee Brown and then Donna Dacuti both of whom sang a couple of very nice songs. Lauralee Brown sang Moondance which was a nice break from Tate’s blues oriented theme music. This was followed by Vine Street Betty. Donna Dacuti did Georgia while DeWitt and Tate read from her arrangement. This was ok but she really killed them with her rendition of Built For Comfort, the Howlin Wolf, Willie Dixon number. Sometimes these sit-in things pay off. Tom Barr sat in on harmonica and added some nice riffs to a lot of the blues stuff. He also assisted on background vocals with Lonnie Walter. Tate finished the evening with Minnie The Moocher, Cab Calloway’s story song about a poor delusional woman who doesn’t have anything but a heart of gold. Tate plays the ukulele on this song for good effect. The quick decay of the plunka plunka ukulele voice actually drives the rhythm. This song probably goes on a little too long because he prattles on about Minnie and then thanks the No Name, the bartender, every member of the band and what ever else comes to mind. The audience chimes right in with the hi de hi de hoes until the end. Wendy DeWitt has an unbelievable left hand for the piano. While the left is playing a driving bass line, the right is drawing out a melody. All the while, the voice is singing and sometimes shouting. With Joe Tate laying down some guitar riffs, Lonnie Walter mends it all together with a rhythmic tattoo. Also sitting in was Kurt Harwood who brought his congo drums. These added a nice bass spectrum to the percussion. He also doubled on tamborine and some other small gadgets. Wendy and Joe took turns on vocals every two songs. Starting off with some New Orleans sounds, the genre drifts to rock, country and a little Hawaiian. Joe sang “Over The Rainbow” while Wendy peeked over his shoulder at the chart. For this, Betty the bartender came out and stuffed money in the tip jar. Others followed her, though it’s not clear why except it’s clear people love this song. It was a cold and rainy night and the tourists came in shivering. Quite a few Irish Coffees disappeared and there was quite a bit of merriment. There may have been some intoxication too. In spite of this the mood was upbeat with plenty of laughter. DeWitt’s playing was spectacular as usual. Lonnie Walter played a few bongo solos that were extraordinary. Tate held the middle together as well as possible between the staccato drums and the piano orchestrations. The evening ended with Joe’s rendition of Minnie The Moocher to which the audience sang along. Myron Mu was there to pick up Lonnie and he told us that Johnny Nitro had died about an hour earlier. Lonnie, who was really upset, told us we would have to find someone else for March 19 when Nitro was schedule to play at the No Name bar. You can also download a PDF of “Last Voyage Of The Redlegs” from this site. The Gaters consist of some left over Redlegs including Joe Tate, Maggie Catfish and Jeff Costello. They are joined by Lonnie Walter on Bongos. The name has nothing to do with alligators but rather with the fact they are all from the Gates, an area of the Sausalito waterfront where Liberty ships were built in WWII. There still exists three distinct areas that still have their WWII names; Gate 3, Gate 5 and Gate 6. There is also another section referred to as Gate 6 1/2 but, this is not historic nomenclature, just a convenient name for what would be an extension of Gate 6. 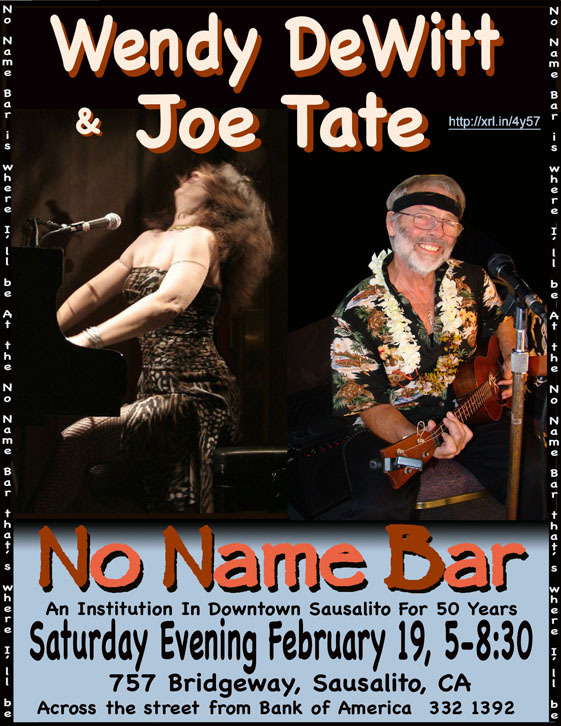 Anyway, Joe Tate plays the No Name Bar every Saturday with various artists. The Gaters are a special feature for Joe because of their long history together with the Redlegs. Jeff Costello maintained excellent work on the guitar, providing brilliant solos as needed. Jeff also helped out with some vocals and, as always, Lonnie Walter held it all together with the bongos. Joe covered all his usual basses, singing in a strong baritone voice. While narrating the early history of the No Name bar, he does a little Name dropping about the various celebrities who have hung out there over the years. There was a nice crowd of friends who attended along with many unsuspecting passersby who just popped in when they heard the music. The flyer features a picture of Maggie and Joe taken at the drydocks of Richardson Bay many years ago.